Off the pitch Wigan Athletic are now debt free, but on the pitch the season took a downturn as Everton overcame them 3-1 at Goodison Park. Not only did they lose the game, but they also lost striker Hugo Rodallega with a serious knee ligament injury which could rule him out until Christmas. 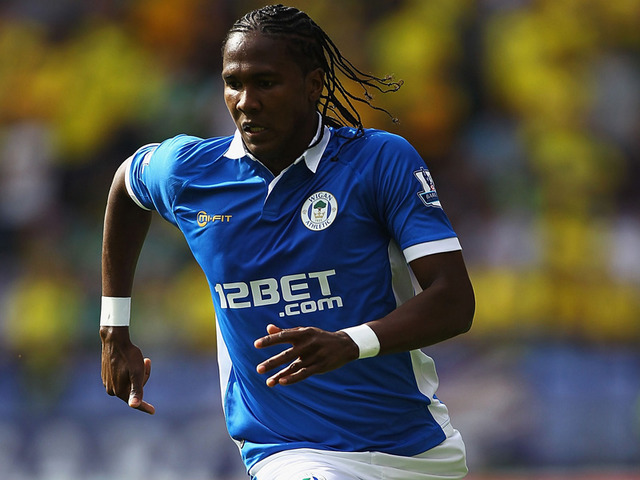 Rodallega is crucial to Wigan’s attacking play and his creative and goalscoring abilities will be sorely missed as we enter a difficult period for the club. Latics are already without key defender Antolin Alcaraz for three months, plus there are injuries to Emmerson Boyce, Steve Gohouri and Mohammed Diame to contend with. Wigan do not have the strength in-depth of the bigger clubs and injuries to key players will severely restrict their options over the coming months. For much of the game on Saturday Latics looked like they might take a point against opponents somewhat lacking in confidence, but two late goals by substitutes Vellios and Drenthe took the three points for the Toffees. Latics took the lead through another deflected goal by Franco Di Santo. That’s three deflected goals for Di Santo this season, but the Wigan fans won’t care if all his goals are deflected, as long as he keeps on scoring. But almost as soon as the fans had sat down from celebrating the goal Everton equalised. Wigan’s vulnerability from set pieces is clear to see, Everton’s corner was headed against the bar by Tim Cahill, who easily got in between central defenders Gary Caldwell and Maynor Figueroa, and Phil Jagielka was left unmarked to poke home the rebound. The second Everton goal was a similar affair, a good cross into the box by Hibbert and Apostolos Vellios muscled his way between Caldwell and Figueroa to head home. The third goal came from a route one pass which Figueroa, Caldwell and Lopez all failed to cut out and Drenthe finished comfortably. Without Alcaraz and Boyce the defence looks ill at ease, Lopez and Caldwell both had disappointing games, Figueroa is much better at full back, only debutant loanee Patrick Van Aanholt excelled at left back. Caldwell may be a good leader but his performances this season have been lacklustre, his distribution is poor and he lacks pace. Lopez is still young, but he is struggling to adapt to the physicality of the Premier League. The defensive frailties are for all to see and now that we have lost Rodallega our attacking options have been severely curtailed. Boyce and Diame may be fit for our next game, but I’m afraid to say that without Alcaraz and Rodallega we will still have our work cut out, as we face an in form Spurs who demolished an expensively assembled Liverpool team 4-0 on Saturday. This entry was posted in Adrian Lopez, Everton, Franco Di Santo, Gary Caldwell, Hugo Rodallega, Patrick Van Aanholt, Wigan Athletic and tagged Everton, Franco Di Santo, Hugo Rodallega, Wigan Athletic. Bookmark the permalink.